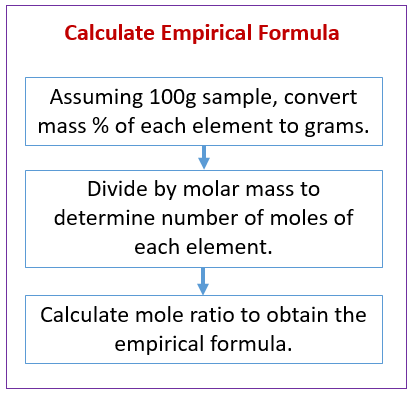 The following diagram gives the steps to calculate the empirical formula when given the mass percentages. Scroll down the page for more examples and solutions. How to Calculate Empirical Formula from Mass Percentages? A white powder used in paints, enamels and ceramics has the following percentage composition: Ba(69.6%), C(6.09%) and O(24.3%). What is the empirical formula? How to Calculate Molecular Formula given molar mass and Empirical Formula? Molar mass is 116.24 g/mol and empirical formula is C3H8N. What is the molecular formula? How to Calculate Empirical Formula from Mass Data? One of the compounds of iron and oxygen occurs naturally in the mineral magnetite. When a 2,447 g sample was analyzed it was found to have 1,771 g of Fe. Calculate the empirical formula of this compound.